South Africa is one of the world’s largest producers of coal. It produced 260 million tonnes in 2012. Around 77 per cent of the country’s energy is derived from coal (compared to the global average of 36 per cent) – and this includes 40 per cent of its liquid fuel use. Given this heavy dependence on coal, the wide range of research at NWU explores many aspects of cleaner coal technology. This work is funded by the National Research Foundation (NRF), the South African Research Chairs Initiative (SARChI), Sasol and Eskom. 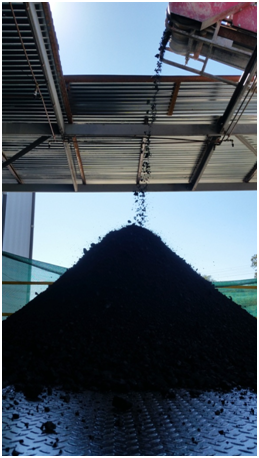 Understanding physical stability, drainage rates and atmospheric oxidation for different grades and sizes of coal is an essential consideration if one is to make best use of this resource. 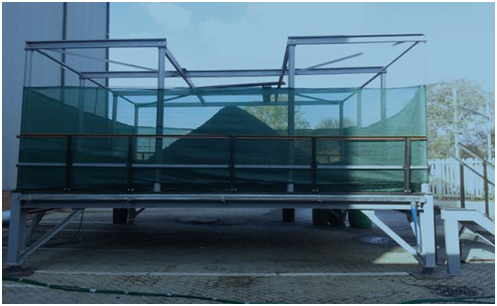 The NWU School of Chemical and Minerals Engineering has a large outdoor rig for studying the impact of weather on stockpiles of coal and it can handle up to 13 tonnes of material (depending on particle size distribution and angle of repose). The rig is equipped with several nozzles that simulate rainfall (measured with a flow meter). Water run-off is collected, measured and analysed. Thus, the amount of water that has been retained by the stockpile can be determined using mass-balance calculations. A weather station is attached to the rig. It measures air temperature, relative humidity and wind speed. Load cells continuously measure the mass on the rig, and any loss is attributed to evaporation. This enables the research team to relate changes in mass with weather conditions. Stockpile storage is also important in terms of process safety and reducing environmental impact. This research can help dust management, prevent spontaneous combustion (via monitoring the internal temperature of the heap) and contamination through water run-off. There’s a lot of interesting research here that I look forward to hearing more about, but I’d like to leave you with an example of how chemical engineering matters to all students at NWU – not just those studying the subject. NWU hosts the NRF Research Chair in Biofuels – a position held by Professor Sanette Marx – and some of her research involves the development of a waste oil to biodiesel process. A plant has been commissioned on the campus specifically for this purpose. It uses waste cooking oil feedstock collected from the university catering facilities and the surrounding Soweto area to produce 165,000 L of biodiesel annually. This fuels the PUKKI Pendel® on-campus transportation buses that are free for all students to use. So you can see that the research at NWU covers both established energy sources such as coal, and newer, more sustainable alternatives like biofuels from waste. 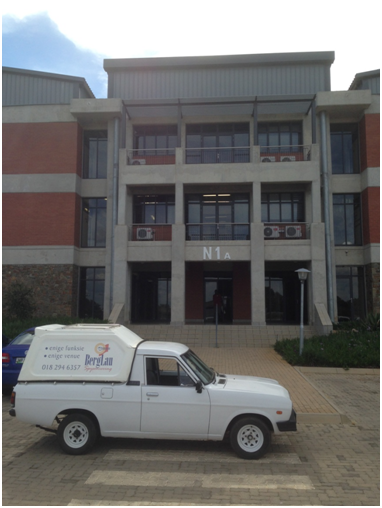 Chemical engineers are versatile wherever you find them and South Africa is no exception. Nice to seem some university research being carried out at the industrial scale.
. .reminds me of the (to me Ginormous) stockpile of coal at t’pit in Kirkby-in-Ashfield immediately postwar; and that later it was the huge stockpiles of coal held at power stations that enabled Thatcher to effectively close down the mining industry in Britain. And now that it has been demonstrated beyond a peradventure that there are vastly more fossil fuel resources (reserves, even) than can be burned without planetary disaster – why is it we hear so little about the fossil fuel industry’s exit strategy? Or are these industries, cushioned by around $2 trillion/year of subsidies, leading us to hell in a handcart? Removing the subsidies would certainly help.